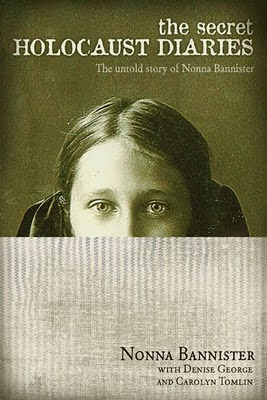 Tyndale generously sent me a review copy of The Secret Holocaust Diaries: The untold story of Nonna Bannister by Nonna Bannister with Denise George and Carolyn Tomlin. In September of 1927, Nonna was born to a well-to-do, loving family in Russia. She had a happy young childhood and was well educated. When WWII began, Nonna's privileged life slowly started to change. Nonna and her parents left the city for the assumed safety of her beloved grandmother's country estate. When Nonna was only 15 years old, she and her mother unknowingly became German prisoners as they agreed to leave their village and work in a factory in Germany. After several transfers, Mama and Nonna were sent to a hospital, where Nonna, because of her fluency in several languages, is asked to translate. Without telling too much more about the events chronicled in the book, Nonna (barely) survives that dark time in history and immigrates to America in 1950 after WWII is over. She meets and marries Henry Bannister. She never tells her husband about her painful past. She keeps all of her diaries and photographs hidden in a locked trunk in the attic. "A decade before Nonna died, she took [Henry] by the hand and led him to the attic... 'It's time,' she said. They climbed the attic stairs and sat down beside the old heavy wooden trunk... Nonna pulled a thick stack of legal pads, each long yellow page filled with hand-penned words. 'The translations of my diaries, and my story,' she said. Then Nonna climbed down the attic stairs, and Henry began to read." Nothing is clearly written in Nonna's diary that she was saved, but she was certainly taught of God and mentions her faith. Although she kept her terrible secrets hidden away for so long, Nonna did not seem to harbor any bitterness. And pierced your heart when you lay dead. I read The Secret Holocaust Diaries in two evenings. It was wonderful. It was painful. I closed the book, glad that Nonna’s story had been told, and yet saddened to think that she had borne such a heavy emotional burden for so many years before telling her family. Living today where finding "long-lost" family and friends is relatively easy, I continue to wonder if Nonna's story will help find any of hers, if still living, if still searching for Nonna themselves. Both sad and wonderful, but mostly fascinating, I hope that you will read Nonna's very personal story. Thank you, Vicky and Tyndale, for sending me The Secret Holocaust Diaries to read and review.